Sign up for a free subscription to Urner Barry's Reporter! *Which of the following best describes the primary business or industry of your company? Send via the mailing address noted above. Send via the email address noted above. Are you a current or potential advertiser? Are you located at the headquarter location of your company? What is the total number of employees at your company? Please Add My Company to your Trade Directories. Please Add My Name and Job Function to your Trade Directories. Please Add Email Address Above to your Trade Directories. 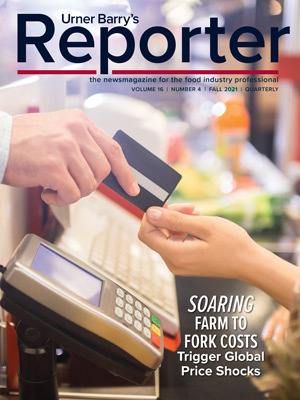 Urner Barry’s Reporter, the newsmagazine for the food industry, is your source for impactful news, analysis, and trends surrounding the center of the plate protein markets and more. 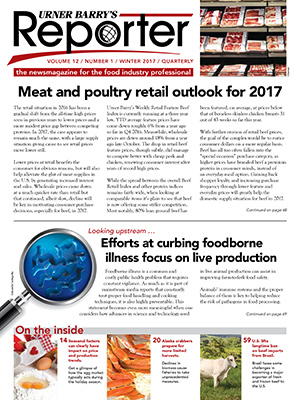 The FREE quarterly publication is packed with insight from Urner Barry’s own market reporters, trusted market sources and other industry contributors. To subscribe, simply fill out the information in the adjacent form and hit submit. It’s that easy! You will not be required to submit any credit card or other personal account information! LA Times: "Avian influenza epidemic spurs nationwide rise in egg prices"
CNBC: "Bird flu aftershocks to drive U.S. turkey, egg prices higher"
Wall Street Journal: "Egg Prices Jump as Bird Flu Spreads"
The Pig Site: "CME: High US Pork Availability Led to Price Decline"